We’re focusing our capital investment and R&D spend on three-year contract with options from the same customer, where selective projects, and, as I said earlier, we’re listening to our the E-ROV will be deployed in a variety of locations and work customers, so we’re con? dent that we are headed in the right scopes, servicing multiple ? elds. The E-ROV can be placed sub- direction. We have a ? ve-year technology roadmap that will sea in a particular location by a vessel of opportunity with a self- be rolled out during this period. The ? rst success is our self- deploying buoy, and it can be recovered similarly by a vessel of contained, battery-powered E-ROV contract award. This con- opportunity and redeployed to another location within 48 hours. North Sea to deploy the ? rst version of our resident vehicle, tonomous and tetherless mode, using battery power. 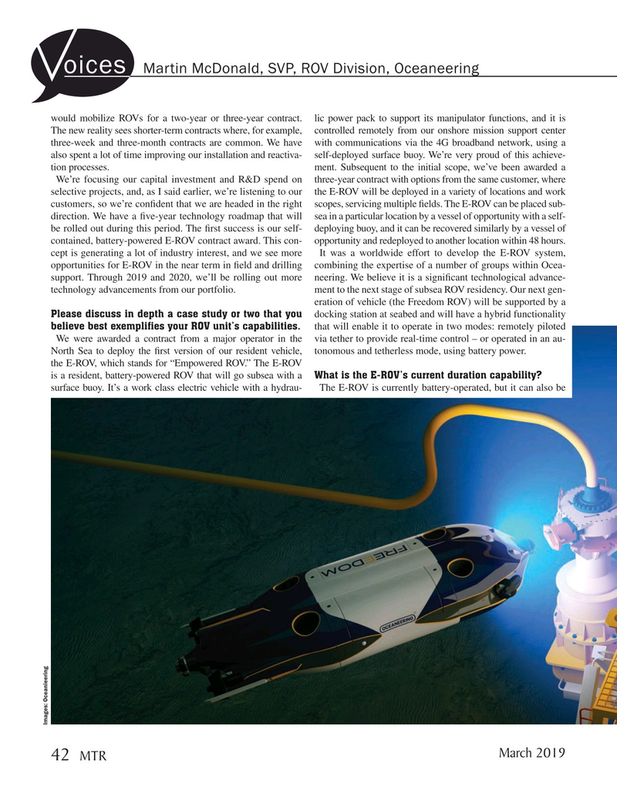 the E-ROV, which stands for “Empowered ROV.” The E-ROV is a resident, battery-powered ROV that will go subsea with a What is the E-ROV’s current duration capability?